Today we have multiple options for a Bluetooth earbud, you can thus research and try out as many Bluetooth earbuds as you want and then settle for the one you believe to be best suited for you. Finding the Best Bluetooth earbuds under 50 dollars is something not everyone will be able to do in the best possible way.It will not only be very confusing but will also take up a lot more than the expected amount of time. 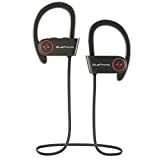 For those who are regular listeners and are very clear about what they are looking for, things might not be as challenging, but for the uninitiated, a detailed guide on the best bluetooth earbuds under 50 dollars would certainly be of great help. In the guide given below, you will not only come across the10 best wireless earbuds under 50 bucksbut also get an insight into the pros and cons of those earbuds as well as which is the best one out of all these earbuds. The options in the list are of the Bluetooth earbuds under $50, so we expect that the price of the product would certainly not be an issue. Apart from the price, other commonly considered factors such as the design, battery life, etc will also be looked into and taken care of. So without prolonging further, we now bring to you the list of 10 best Bluetooth and wireless earbuds under $50. One of the best wireless earbuds under 50 dollars are these ones from Phaiser. These are not only sweat proof and thus ideal ones for runners but are also the cool and funky, available in multiple colors. Whether you consider these to be cheap or not, this is certainly worth the amount you need to pay for it. The specifications of these Bluetooth earbuds are as impressive as its design and have been discussed below. Provides accurate HD sound due to its 8mm speakers and the 4.1 Bluetooth. This has a strong bass, and thus provides a complete noise cancellation for the listener. 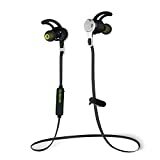 These Bluetooth earbuds have been paired with certain exceptional magnetic abilities, that helps keep both the earbuds together when not in use, this helps provide the necessary security to these earbuds. Although the device is durable and can handle all the roughness, it has still been provided with a safety case, along with multiple other assortments and accessories. This is one of those Bluetooth earbuds, in which we failed to find any drawback! It not only has a great sound quality but also effectively cancels out noise. Verdict –If you don’t want to go too deep in the research for finding the best bluetooth earphones under 50 dollars, you can simply go ahead and buy these ones. They not only possess all the necessary features but also provide additional options like multiple color choices. The battery backup of this device is also impressive, which can last up to 5-6 hours on a full charge. The earbuds in this one are waterproof, so no matter how rigorously you work out and how much you sweat, this will keep on working to the best of its abilities at all times. 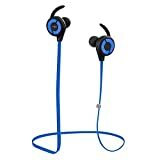 It is common to come across Bluetooth headphones which might or might not be compatible with either Android or iOS. 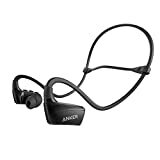 This one from Anker is one of those Bluetooth earbuds which runs equally well, irrespective of whether you are running on Android or iOS. As far as the other crucial features of these earbuds are concerned, they are there and are present in a promising way. The battery life, durability, design, etc of this device is something you can certainly rely on. Given below are its key features and the pain point. With a 4.1 Bluetooth, it offers strong connectivity options that allow us to connect it with any device of our choice. Along with a powerful Bluetooth, it also provides crisp sound that does not let the outside sound to come in. This too has magnetic abilities that not only help keep both the earbuds together but also allows you to easily receive and disconnect calls. The battery life offered in these Bluetooth earbuds is better than what you are offered in the previously described headphones. This can last up to 8 hours on a charge of just 1.5 hours. All things about this are great, except that it does not offer really impressive color choices, you can only choose between black and white. Verdict –This is certainly a reliable headphone, which can provide you with great features. One of the key things you always need to keep in mind while selecting a Bluetooth enabled device is its battery backup, which in this case is certainly great. Apart from this, you can be assured of a clear and crisp sound quality. However, if you are looking for something with more funky and colorful designs, then maybe you should explore other options. The features and performance of this one will also be similar to what has been listed and explained above. The funny part about thisgood bluetooth earbuds under $50is that most of them offer similar quality and features to a great extent. And the majority of them are well performing and worth their cost. This one from Bluephonic is yet another best wireless earbud under 50 dollars. This offers an amazing look, even with the minimum color options that are available. Its pros and cons are listed below. The Bluetooth technology available in this one is 4.1, and this device can easily connect to iPhones as well. Using this you will not come across any hassles of connecting this with any device. 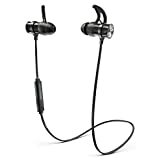 The earbuds available in this one are also waterproof, thus making it ideal for use during workouts. What makes the ideal earbud device is also the fact that it has a powerful and long lasting battery life. This too can last up to 8 hours on the charge of just 1.5 hours. It’s amazing sound quality, which allows for clear, disturbance-free sound is another main reason behind its preference. These are one of the preferred noise cancellation earbuds from Bluephonic. Verdict –This not only provides you with the reliable performance but also offers a design that is considered ideal for athletes. This is one of those few earbuds which comes in the combination of two colors. Although it has only two variants of black and white, both of them are designed in a way that they not only look attractive but also highly usable. The performance of this device does not seem to be the one where you would have issues. This is one of the devices we trust, and you can too. The market for wireless Bluetooth headphones or earbuds is getting more and more competitive with every passing day. Although this competition applies to mostly all markets, these earbuds are something that more and more people are opting for which is the main reason why there is a surge in the number of brands producing them and their availability. Senso earbuds are as good as the ones you have already been reading about. With an ergonomic design and a basic look, this is the earbud that should be preferred by those who are not looking for something very fancy, but one which can fulfill a purpose. Like many other durable earbuds which are ideal for use during workouts, this too has ear hooks for a better grip. Surprisingly cheap, this is one of those earbuds which provides you with a battery life that you certainly would not expect it to deliver. This particular device promises to deliver up to 9 hours of battery after just 1.5 hours of charging. It also goes on to promise up to 2.4 hours of talk time. The noise cancellation abilities, as well as the Bluetooth connectivity options in this headphone are strong and powerful enough to put many of the expensive alternatives to shame. Verdict –This is one of those headphones which you can buy being sure of its quality as well as performance. Although this might not provide you with multiple design or color options, what it does provide is more than enough for a device of this range. The earbuds in this one are also waterproof. We understand that making choices can often be difficult, but our aim here is not to confuse you, but instead brief you with all the possible options you can choose from. This Bluetooth earphone from TaoTronics is one of the cheapest you can come across. It not only costs less but also delivers everything promised. This is one of the complete package kinds of product in the lot. Its pros and cons are listed below. This too has a 4.1 Bluetooth along with CVC noise cancellation technology. Thus being as competitive and efficient as the ones mentioned above. This has all the key elements of an ideal Bluetooth headphone design. Apart from the magnetic abilities of the earbuds, this also provides you with multiple color options. Here too you will find ear hooks, to prevent the device from coming out of your ears when you are running or performing any kind of exercise. This is an ideal option for the fitness freaks, which can perform better with music. Since this is a comparatively cheaper product, it compromises a little bit on the battery life and offers 5 hours of run time. Verdict –Majority of the features present in this headphone are similar to what you get in the above-mentioned options. What can possibly be considered somewhat a drawback is it’s not so long battery life, but that too is overshadowed by its cheap price. This has an ergonomic design, multiple color options, and comes with several other attachments in its packaging. This is one of the trustable options for any user who is looking to buy a product that they can rely on for a long time. After getting over with the top five Bluetooth earbuds in the list, we now come to the ones which will have a little bit more drawbacks. Till now we were only been dealing with limited color options and a not so impressive battery life. Here we will have to deal with an improper basis as well. Although Skullcandy is one of the renowned brands when it comes to devices, its earbuds do not seem to fare too well to occupy a spot in the top five best wireless earbuds under 50 dollars. Its pros and cons have been listed below. This comes with a flex collar that along with being adjusted can also be removed if needed. Through the Bluetooth option, you can take calls in the middle of a song as well, and also change songs. This one does not provide fancy designs or several color options and is also not a very cheap device relatively. The sound quality of the device is good for sure, but it does have a very powerful bass, which might not be appreciated by all users. Verdict –These earbuds from skullcandy sure classify as best bluetooth in-ear headphones under $50 but not as the top-most ones.The price for this one is not very low, keeping in mind the segment we have been discussing in this article. The sound quality and Bluetooth in this one are sure reliable and do not give you a chance to complain, but you might find the bass a bit too powerful and in-fact noisy. The sound mixing in this one does not seem to be too great. However, if you give more preference to a brand, then you can opt for this one as well. Another cheap and affordable one in the list is from MEE. The X6 is another low priced, fairly performing wireless Bluetooth earbud that is available in multiple color options. Like the others this too is lightweight and easy to carry. Since these Bluetooth earbuds are mainly used at the time of workout, they are made waterproof. This one has a nano-coating, which ensures that the device does not get damaged due to excessive sweat. This is compatible with Apple devices as well. Read on to know more about its pros and cons. Along with a long lasting battery life, this also provides you with a real-time battery indicator, especially if you are using this with an Apple device. This has Bluetooth 4.1 and can simultaneously be paired with more than one Bluetooth device. This also has an advanced multipoint functionality through which managing calls as well as songs from multiple devices becomes easier. Since this has been designed for a multitude of purposes, the protective nano coating on the device comes as a great advantage, it not only protects the earbuds from water and sweat but also several other damaging elements. This also provides you with multiple options of earbuds to choose from, present inside the packaging. Verdict –There are enough reasons as to why you should buy this, and not enough for why you shouldn’t. You thus need to apply your own discretion before making a conclusion. This can offer you all that the more expensive options are offering. However, the sound quality in this one might take a back seat if you wish to listen to music loudly for long hours. The strong bass of these earbuds might just give you a headache. One of the clearest sounds providing Bluetooth Earbuds for Running Under $50 in the list are the RIF6 Eargo. The fact that this has ‘running headphones’ in the name itself, suggest that this is certainly one of the best wireless earbuds under 50 for the runners or the gym enthusiasts. As much as we would want to avoid putting it up this way, RIF6 also provides you with the features you have already been well acquainted with in the products mentioned above. For more details on it, keep reading. The CVC echo cancellation technology in this Bluetooth earbud totally cancels out the outside noise and leaves you with nothing but soothing music listening experience. The curved anchor hooks present around the edges of the earbuds prevents the wireless device from falling out of your ear at any time. The Bluetooth connectivity of this one is powerful and connects well with your devices without a headphone jack. This also has multiple extensions inside its packaging. This is not one of the cheapest but is fairly priced. The battery backup in this one is not up to the mark, and it takes up 2 hours of charging to last for just four hours. Verdict –Since it is one of the few last ones from the list of best wireless earbuds under 50 dollars, this might not be the preference for many, and now that a few cheaper ones have been listed prior to this one, and thus have a better ranking, you can choose to drop this. Although its performance is certainly good, the low battery life is what comes out as its greatest disadvantage, and also gives many people a reason to ditch this and opt for other devices. One of the cheapest options that you can come across on the list is this one from Ausdom. The thing about cheap products is that we often don’t trust them. This is in a way discriminatory. If you too are the one who believes cheap goods are not good enough, you should definitely give this one a try. The features offered in this one are again no less than what you get in all the high priced ones from the list. Although there might be some obvious differences in the quality, this still would not disappoint you. The earmuffs offered in this one are made from silicone, and you are provided with several of those, to choose the best one amongst them. The 4.1 Bluetooth technologies smoothly connect you with multiple devices and also allow you to freely take calls without involving the use of your hands. Through the inbuilt microphone, you can also adjust volume levels and tracks. The 120 mAh battery provides you with a playtime of 8 hours and promises a talk time of 9 hours. This is way more than what would be expected of a device at this rank and this price. Verdict –For those of you who are looking for something that is top notch, this might not be the best option. But for those who are looking for something that is low cost and provides a quality as good as the one in top ranks, this is definitely a device you should try out. This certainly has the potential to surprise and live up to your expectations. The only reasonable drawback in this one is the limited design and color options it provides. You can only choose from their black ones. As the name suggests, these are Bluetooth headphones for runners and fitness enthusiasts, thus being sweat proof. Although these are the last ones in the list, they too do not miss out on either of the main features of a Bluetooth wireless earbud. These are surprisingly available in a much cooler design and color than the remaining ones which are available in black or white only. The royal blue color of this one makes a preferred choice for those who do not wish to spend much but want a cool design. The features of this one are not very different from the ones found in the above-mentioned earbuds. This has a 4.1 Bluetooth technology using which you can play music; change tracks as well as take calls. The battery life of this one lasts up to 5 hours after charging for around 2 hours. This does not have any magnetic functionality but is certainly a durable and reliable device. These are as much sweat proof as any other device in the list. And offer noise cancellation abilities at par with the best ones in the list. These are priced affordable and provide you with all the necessary features that you would need to sweat it out during your fitness sessions. Verdict –This not only delivers well but also provides you options to choose from multiple color choices. This can effectively cancel out outside noise and provide you with the kind of audio listening experience you would be looking forward to. These are as easy to wear and use as all the above. There isn’t anything exclusive to this device, however, it is also not the one that would make you regret it or feel it was no good. 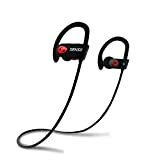 There are multiple similarities in the above mentioned best Bluetooth earbuds under 50 dollars, most of them make use of CVC noise cancellation technology, are sweat proof, ideal for use during workouts, and have 4.0 or 4.1 Bluetooth technology. These are those features which are same for the devices listed above; the difference among them comes from their prices, battery life, and sound technology. The ones that are more expensive have a better sound quality, mainly because they use more advanced technology. However, all of these are equally effective in canceling out noise from the external environment. The best wireless earbuds under $50 are marketed primarily as devices to be used by those into fitness activities like jogging, cycling, gym, etc. This is why they are not just light weight and easy to carry, but also durable and waterproof. When we say waterproof, do not take these with you when you go out swimming, as that might just get too much for these devices to take. Waterproofing is done mainly around the earbuds to prevent them from getting damaged from your sweat. And even if they do get damaged, you are provided with a few extras in the packaging of almost all these Bluetooth wireless earbuds. So make sure you have one of these with you when you go for a workout the next time.